ST. AUGUSTINE, Fla. (CNS) — More than 500 people at a July 7 vespers service at the Cathedral Basilica of St. Augustine greeted a first-class relic of the saint that is the patron of the city, the cathedral basilica and the Diocese of St. Augustine. 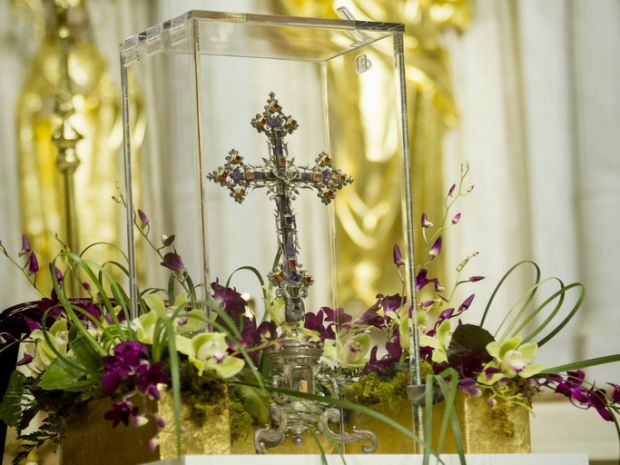 The relic of St. Augustine of Hippo is on loan from the Vatican Treasury for the 450th anniversary celebration of the city and cathedral parish. As Deacon Charles Kanaszka carried the relic in procession, many who attended the ceremony captured the moment with camera phones in hand. It is the first time the relic has been in the United States and it will be in the Diocese of St. Augustine through Sept. 30. “To understand why what we do tonight is important and the reason that our church is making a big deal about it, we first have to understand a key belief in Catholic-Christianity — the Incarnation,” he said. Carol Ann Fox, a member of St. Anastasia Parish in St. Augustine, has seen relics in Lourdes, France, and Fatima, Portugal. “(A relic) is a nice reminder of what the church offers to us as its members. It is a blessing to be here,” she said. Debbie Womack of Crescent Beach, who is a member of Corpus Christi Parish in St. Augustine, brought two of her grandsons from Jacksonville: Peter, 10, and Andrew, 9. They attend Assumption School. Cam Baker, an usher for the cathedral basilica, found the service “very moving.” It was the second time he has seen a relic, the first being that of St. John Paul II in 2014, also at the Cathedral Basilica. Father Willis later reflected on the event, too. Father Willis first asked for a relic of St. Augustine more than four years ago. The planning and coordination between Vatican and Italian officials and the Diocese of St. Augustine culminated in June when the relic arrived at the Catholic Center in Jacksonville. This is the first time the relic has left Italy, Father Willis said. St. Augustine’s connection to the city and the parish began Aug. 28 — his feast day — in 1565, when Spanish explorer Don Pedro Menendez de Aviles sighted land off Florida’s coast. He founded the new colony, St. Augustine, on Sept. 8, the same day the parish was founded. The next public veneration was scheduled for July 15 at the cathedral basilica. There will be one more July date for veneration, July 29, and then four dates in August and four in September. Pope writes for St. Augustine Catholic, the magazine of the Diocese of St. Augustine.